, a miscellaneous writer and critic, was born at Sittingbourn in Kent, in which place his father was an eminent attorney. His grammatical learning he received at Isleworth in Middlesex, and afterwards applied himself to the law; but, finding that pursuit tedious and irksome, he quitted it for the profession of poetry. According to the editors of the “Biog. Dramatica,” his first appearance in this profession was not much to his credit. One Henry Mestayer, a watchmaker, had written a play, which he submitted to the correction of Theobald, who formed it into a tragedy, and procured it to be acted and printed as his own. This compelled the watchmaker to publish his own performance in 1716, with a dedication to Theobald. The editors of the Biog. Dram, who appear to have examined both pieces, observe that Theobald, although unmercifully ridiculed by Pope, never appeared so despicable as throughout this transaction. 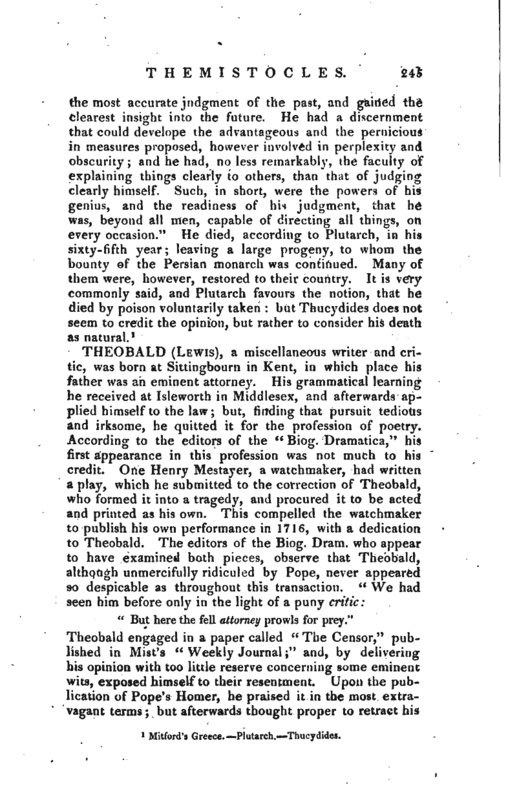 “We had seen him before only in the light of a puny critic:” But here the fell attorney prowls for prey.“Theobald engaged in a paper called” The Censor,“published in Mist’s” Weekly Journal;“and, by delivering his opinion with too little reserve concerning some eminent wits, exposed himself to their resentment. Upon the publication of Pope’s Homer, he praised it in the most extravagant terms; but afterwards thought proper to retract his | opinion, and abused the very performance he had before affected to admire. Pope at first made \ lie*, a.d tin* Jhto of his” Dunciad;“but afterwards thought proper to disrobe him of that dignity, and bestow it upon another. In 1726, Theobald published apiece in 8vo, called” Shakespear Restored:“of this, it is said, he was so vain as to aver, in one of Mist’s” Journals,“ct that to expose any errors in it was impracticable;” and, in another, *; that whatever care might for the future be taken, either by Mr. Pope, or any other assistants, he would give above five hundred emendations, that would escape them all.“During two whole years, while Pope was preparing his edition, he published advertisements, requesting assistance, and promising satisfaction to any who would contribute to its greater perfection. But this restorer, who was at that time soliciting favours of him by letters, wholly concealed that he had any such design till after its publication; which he owned in the” Daily Journal of Nov. 26, 1728.“Theobald was not only thus obnoxious to the resentment of Pope, but we find him waging war with Mr. Dennis, who treated him with more roughness, though with less satire. Theobald, in” The Censor,“N 33, calls Dennis by the name of Furius. Dennis, to resent this, in his remarks on Pope’s Homer, thus mentions him:” There is a notorious idiot, one Hight Whacum; who, from an under-spur-leather to the law, is become an understrapper to the playhouse, who has lately burlesqued the Metamorphoses of Ovid, by a vile translation, &c. This fellow is concerned in an impertinent paper called the Censor." Such was the language of Dennis, when inflamed by contradiction. which he calls a marvellous line of Theobald, “unless,” says he, “the play, called * The Double Falshood,' be (as he would have it thought) Shakspeare’s; but, whether this is his or not, he proves Shakspeare to have written as bad.” The argument* which Theobald uses to prove the play to be Shakspeare’s, are indeed, far from satisfactory, and it | was afterwards Dr. Farmer’s opinion that it was Shirley’s. 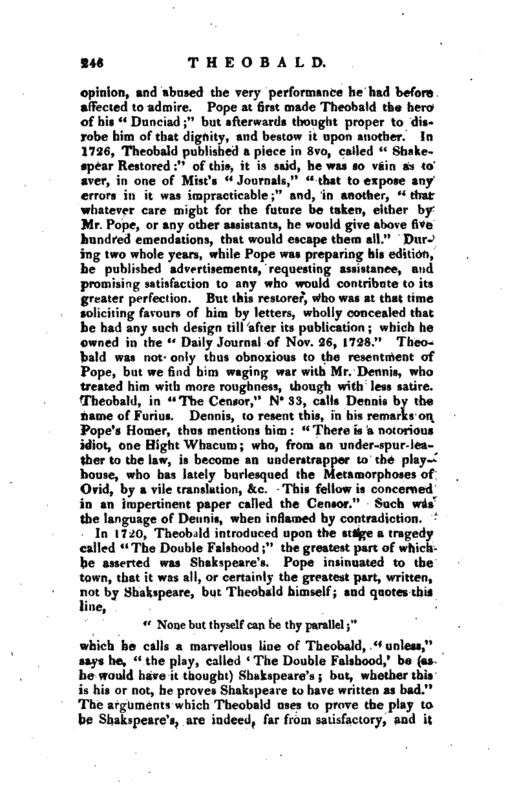 It was, however, vindicated by Theobald, who was attacked again in “The Art of Sinking in Poetry.” Theobald endeavoured to prove false criticisms, want of understanding Shakspeare’s manner, and perverse cavilling in Pope: he justified himself and the great dramatic poet, and attempted to prove the tragedy in question to be in reality Shakspeare’s, and not unworthy of him. Theobald, besides his edition of Shakspeare’s plays, in which he collated the ancient copies, and corrected with great pains and ingenuity many faults, was the author of several dramatic pieces. 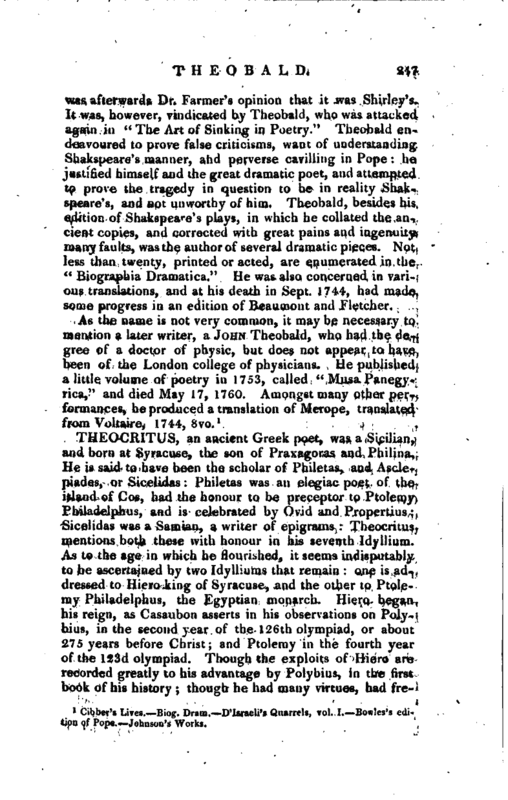 Not less than twenty, printed or acted, are enumerated in the “Biographia Dramatica.” He was also concerned in various translations, and at his death in Sept. 1744, had made some progress in an edition of Beaumont and Fletcher. Cibber’s Lives.—Biog. Dram.—D’Israeli’s Quarrels, vol. I. Bowles’s edition of Pope.—Johnson’s Works.